Let’s be honest, the holiday season should be about goodwill, eating and relaxing. Instead, most people are way too busy with their Christmas To-Do list: buying gifts, wrapping them as pleasantly as possible, decorating the house and generally making everything as perfect as can be. Online shopping has made a huge difference in this scenario over the past couple of years. Obviously lots of people choose to get everything online. Thanks to the increased amount of internet-based orders, fraud managers have no rest either during this period. Fraudsters are specifically targeting online retailers. It’s the perfect time of the year, for them to work even harder (just like the Grinch) and find even more loops in the system. Meanwhile, online businesses are paying the associated costs. This also means that fraud managers bear high stress levels from having to work extra long shifts in order to manage the manual review queues. According to a recent Deloitte estimate, the 2017 holiday sales will increase by up to 4.5% compared to 2016 sales. The annual holiday survey suggests that the majority (51%) of Americans’ holiday budgets will be affected by internet-based retail channels. This contributes to an approximate increase of 21% in 2017 e-commerce sales compared to 2016 figures. Furthermore, the growth in the digital channels is coupled with a substantial increase in online fraud. During the holiday season of 2016, global fraud attempts increased by 31% according to the benchmark data from ACI Worldwide. The trends didn’t change this year, as Cyber Monday had the biggest increase in website holiday season attacks. Fraudsters are extremely damaging during this time of the year. Cyber-security breaches also bear a damaging effect on the customer experience related to online retail. According to a Sitelock study emailed to Retail Dive about 30% of consumers do not plan to shop online this holiday season due to concerns about how well-protected online shopping sites are from security threats. 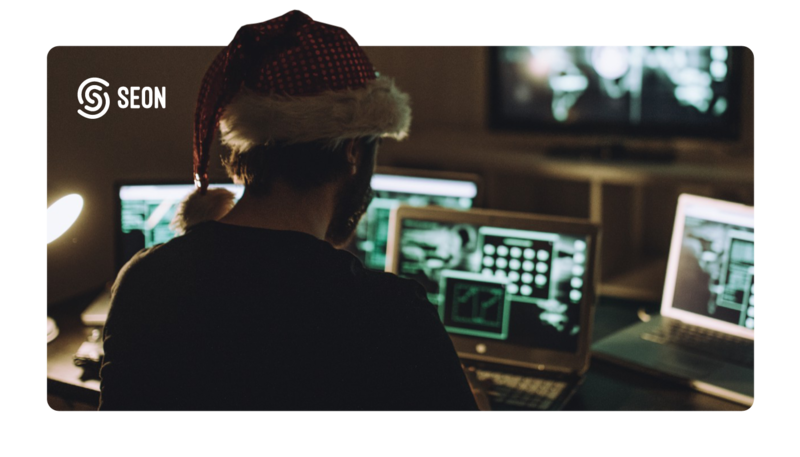 The holiday ’Grinch’ fraudsters can cause serious losses in the revenues of the online businesses if customers are too fearful to shop, especially during the holiday season. There is obviously a huge pressure on online retailers during this time of the year and they are lacking the capability of adapting to new fraud patterns. Thanks to the new capabilities of machine learning models, this problem can be solved easily. The analysis of complicated data can now be used to identify patterns and highlight trends that are too complex to be noticed by human fraud analysts. Machine learning will most definitely replace traditional fraud detection techniques. Luckily, online businesses have the opportunity to mitigate their risk related to fraud using top of the curve third party services. The SEON risk management tool utilises valuable features such as email verification, device fingerprinting, IP analysis and transactional data analysis. The combination of these unique features forms a highly qualified system. Therefore, SEON sustains a balanced environment for online merchants with the opportunity for them to maximize their revenue. Online businesses bear a constantly growing responsibility in terms of fraud detection. This is especially true during the holiday season. Retailers must keep up with the latest technologies in order to ensure the best of customer experience.